As well as the sidebar and custom class options for formatting text, Blocs also has some basic text formatting options included on the item selection marker, that is shown when you select a text bric. These options allow you to make text Bold, Italic, Underlined or appear with a Strikethrough. They also allow you to convert text to links or wrap words in span tags in order to style sections of the content independently from the surrounding text. To apply any of these formatting styles, simply Double Click a text bric to make the its content editable, select a portion of text and Left Click the relevant button, located on the selection marker, to apply the desired formatting style. 1. Bold – Make selected text bold. 3. Underline – Make selected text underlined. 4. Strikethrough – Give selected text a strikethrough. 5. Wrap in Span – Wrap selected text in a span. 6. Create a Link – Make selected text a link. 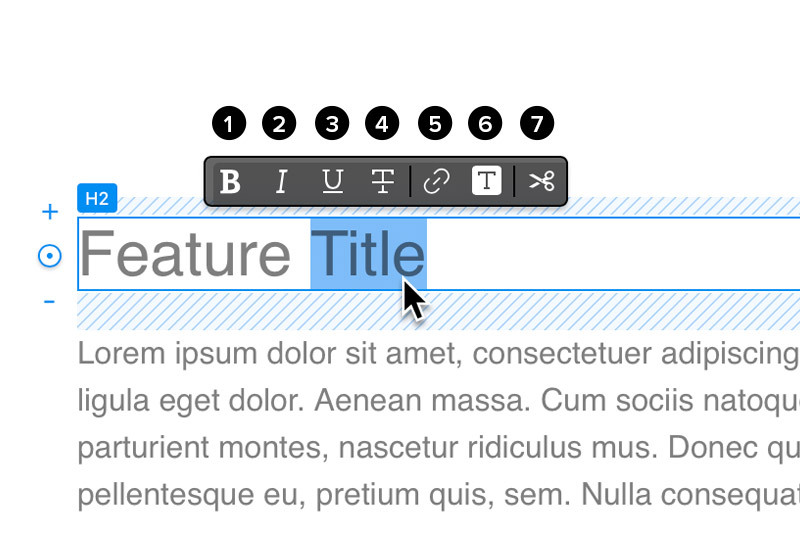 If you require more advanced text formatting controls, we recommend using a custom class to style your text.